When preparing meals theses days, not only must I be frugal and healthy conscious, but also I must consider the gluten free eaters around here. Sometimes my brain stalls, sometimes it is creative, and sometimes my brain just tells me to go with what I have in the fridge/pantry. The youngn’s were hungry here one weekday after pouring over economics, and math, and history and needed a break. 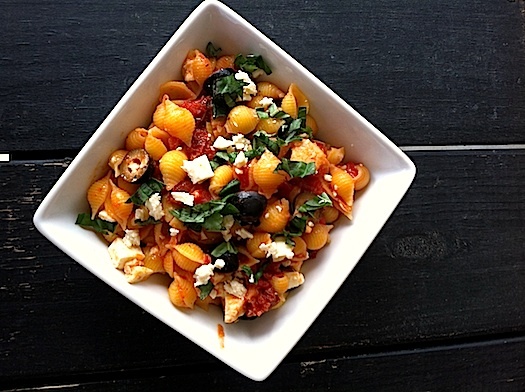 We all huddled in the kitchen and together created this tasty pasta dish. You can create your variety to suit your taste buds. I boiled a package of gluten free shells, according to the directions, and drained them. While the pasta was boiling, I took 1/2 stick real butter and sauteed half a chopped sweet onion and a couple of cloves of chopped garlic with the butter in a large skillet. Then I added 2 14 oz cans of petite diced tomatoes, 1/2 cup diced sun dried tomatoes, 1 small jar chopped artichoke hearts, a small can of sliced olives, and a bit of salt and pepper. Next I dumped the whole pot of drained, cooked pasta into the sauce and stirred it around a minute or two. Before serving I crumbled an 8 oz block of Feta cheese and tossed it into the pasta and sauce along with several leaves of fresh chopped basil. We served it up in bowls and some salad on the side. Mmmm that was one of the best school lunches we’ve had in a while. That looks so yummy, and it’s filled with all my favorites!! !